Cannabis-infused butter, or cannabutter, is one of the easiest, and most common ways of making cannabis-infused edibles. It can easily be made at home, and by following a few simple steps you will end up with great quality cannabutter which can be used in a variety of applications. Cannabutter can be substituted 1:1 for butter in any recipe that you are making, but remember to keep your prescribed dosage in mind when determining how much cannabutter to use. It’s important to note that homemade edibles can present some difficulty when it comes to determining your proper dosage. To help with this issue, we have included some tips for calculating the potency of your cannabutter below. When consuming cannabis edibles, always remember to start low and go slow. To decarboxylate your cannabis, preheat your oven to 240ºF Place your cannabis on a baking sheet in a single layer, and tent with tinfoil. Bake for 40-50 minutes, until the cannabis appears dry and brown with a crumbly consistency. In a medium sauce pan, bring water to a boil. Add butter, and let it melt completely. Add the decarboxylated cannabis and reduce the heat to low. Allow the butter mixture to simmer for three to four hours, checking often to ensure it does not reach a full boil. While simmering, make sure to cover the pan with a lid to reduce the amount of water lost to evaporation. If too much water is lost, add more as needed. If you are using cheese cloth to separate the cannabis from the butter and water mixture, stretch it over the large bowl, and fix to the rim using an elastic band or tape. If using a sieve, place it over the large bowl. Pour the mixture through sieve and/or cheese cloth into the large bowl. If using cheese cloth, be sure to gather the edge of the cloth, and squeeze any remaining liquid into the bowl. Use caution with this step as the mixture could still be very hot! Let the butter sit at room temperature for about an hour, then place in the fridge to solidify. Once solid, use a knife or spatula to separate the butter from the water. Discard the water and store the butter in an air tight container in the fridge for up to two months. The butter can also be frozen for up to six months. 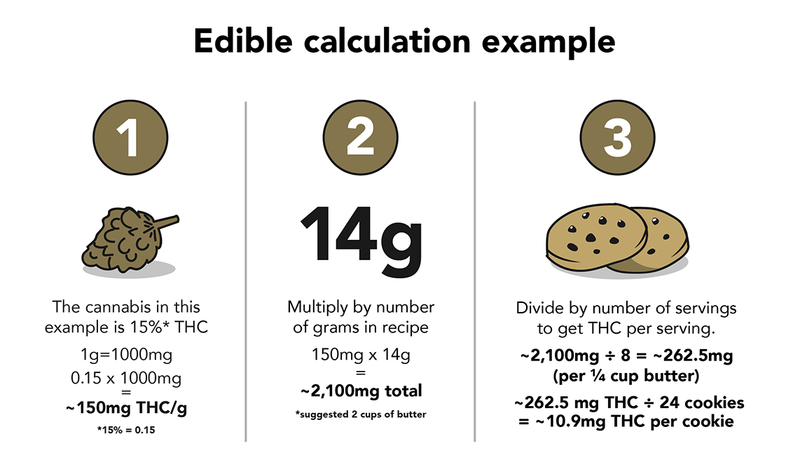 Calculating the potency of your edibles can be a bit tricky. Below are the steps you should follow to estimate the dosage of your finished edible product. For this example, we’re going to use our Chemdawg strain for the calculations. Chemdawg is tested at ~15% THC, you’ll need this number when calculating the potency. Always remember to start low and go slow. Calculate the total milligrams of THC or CBD in one gram of dried cannabis. For Chemdawg, which tests at ~15% THC, this equals 150mg per 1 gram (1000 mg) of dried cannabis. Calculate the total amount of THC or CBD in the butter that you are making. To do this, multiply the milligrams of THC and/or CBD per gram by the total grams you are using. Calculate the total amount of THC or CBD per edible. For this example, we will assume that the recipe you are making will use ¼ cup of the cannabutter recipe above and yield 24 cookies. Divide the total milligrams of THC butter by eight to get the number of mg in a quarter cup and then divide that number by the number of edibles made.